Yesterday's day out at the football harked back to times of past. I had the rarity of company on the train journey to SE7, my travelling companion was a Charlton lad I used to see regularly at my place of work ten years back, yet now, although living in the same distant outpost of a town as myself, a very infrequent but always enjoyable rendezvous. Then there is the fanzine. Yes, Voice of The Valley is back in print! After an absence of over ten years, your pre match build up can consist of parting with a couple of quid to purchase the most successful of all the old Charlton fanzines. In today's modern era of football coverage, when goals and takeovers are re-tweeted by people on the other side of the planet seconds after the event and the internet is full of forums, message boards and nonsense like this blog, you could argue that there may not be a place for a printed voice of the fans, especially when it's most likely out of date by the time you read it. 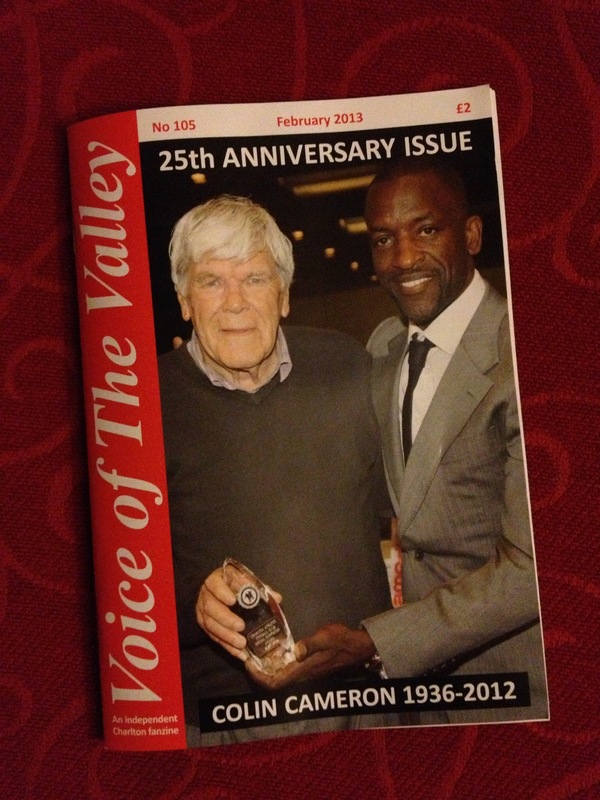 Voice though has a great format which Rick Everitt (editor and until very recently former club employee) has resisted in violating, the columns remain the same and the content (apart from some self congratulatory reminiscing) hard hitting, well written and very much heartfelt. As more and more people get disillusioned with the modern game and fanzines like Stand AMF gather more momentum and support you realise the need for a well constructed fanzine has never actually been more imperative. As if these events before kick off weren't already rolling back the years, entry into the stands also revealed a football pitch with large areas of mud, the real stuff that stops a pacy football from rolling dead in it's tracks. We are conditioned now to expect football to be played on green carpets of perfect turf as they grace our TV screens almost daily, and in fairness over previous seasons gracing the centre stage of The Valley too. We are astonished to see what resembles a non league playing surface in the Championship, the Charlton players also as they had been bemoaning the fact for a while prior to the game. As with all these things it does affect both sides the same but if your assault on the opposition is based around a neat flowing passing game you are, to put it politely, buggered. Chris Powell had reverted to playing two up front with Kermorgant returning to partner Fuller and Dale Stephens also back at the heart of the midfield. Stephens of course known to use 'deftly passing the ball' as his preferred weapon of choice. Needless to say they didn't all reach their intended target yesterday. The midfielder did get stuck in though, his number 8 shirt filthy and resembling something worn by Mark Kinsella in his heyday. As games go, for eighty eight minutes it really wasn't much of a spectacle. A goalless game to forget looked to be on the cards, Birmingham seemed content to hold on for a point from the off and Charlton just looked frustrated, with both the pitch and each other. We had chances, more than I recall I suspect but they were either agonizingly close (the Birmingham keeper putting in a man of the match display) or totally squandered. That ball just wasn't going in the net today. People were flocking out of the ground to beat the rush as Chris Solly floated a gorgeous ball into the box, Yann Kermorgant had a yard on his defender and made no mistake to nod home. It was a goal of pure merit and possibly far too good for the game it graced. Finally Charlton had snatched three points late on rather than the inexperienced collapse we were in danger of growing accustomed to. The fourth official indicated four minutes of stoppage time, time to be professional and play the clock down. Birmingham had just had the wind knocked completely out of their sails hadn't they, sails that had at best barely got them moving previously. We defended in numbers packing our area looking like Charlton always do, edgy. With so many red shirts in the box it's almost unbelievable that Wade Elliott had as much space as he did. Just a couple of yards out as a hopeful ball went through a crowd directly to his feet where from where I was sat he looked to give a cheeky back heel past Hamer. Again we were the perpetrators of our own undoing. The final whistle blew and the red shirted players were all motionless, trying somehow to take in what had just happened. I walked out of the ground feeling like we'd been beaten. I was so shell shocked that for a moment I actually believed we had been. There are a good half dozen worse sides than us in this division, the trouble is they all seem to be picking points up at the moment. Hull beckons next week, a trip to a top four club. Not the easiest of places to turn our fortunes around but this is Charlton, expect the unexpected. It's emotional being an Addick, yesterday was the latest proof of this, but all the time we've got a voice we've got a chance. Come on you reds! Good read, Al. I hope you had a couple of beers to dull the pain afterwards! Author of both God, Charlton and Punk Rock and Arsene Wenger's Coat. A guest for others.